I’ve been reading this book called Craft Inc. 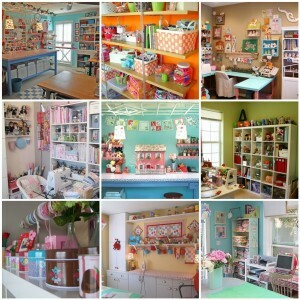 Turn Your Creative Hobby Into a Business and it’s got me daydreaming about a life where my days are whiled away in a beautifully decorated craft room. 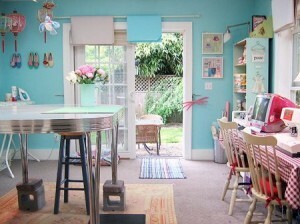 In that beautiful room I’d be inspired to make precious heirloom baby quilts and hug pillows. I’d make a name for myself in the crafting world and people would seek out my wares. Some rich, famous and beautiful celebrity mama would be photographed on the pages of a mag with their celebrity offspring clutching one of my handmade blankies and then I could start charging top dollar for custom made blankies and hire a partner to adopt my techinques and share in the spoils….Alas, I am not independently wealthy and therefore unable to make this dream a reality (yet). But reading this book and looking at inspiring craft rooms, like that of Alicia Paulson , Jenny B’s All Sorts, FroggyMonkey or HappyZombie among others, is almost enough to make me get off my behind and create a special space for myself in my home. Well, one of these days my threats might actually convert from idle to real and I’ll follow through. In the meantime, I’ll enjoy the eye candy.